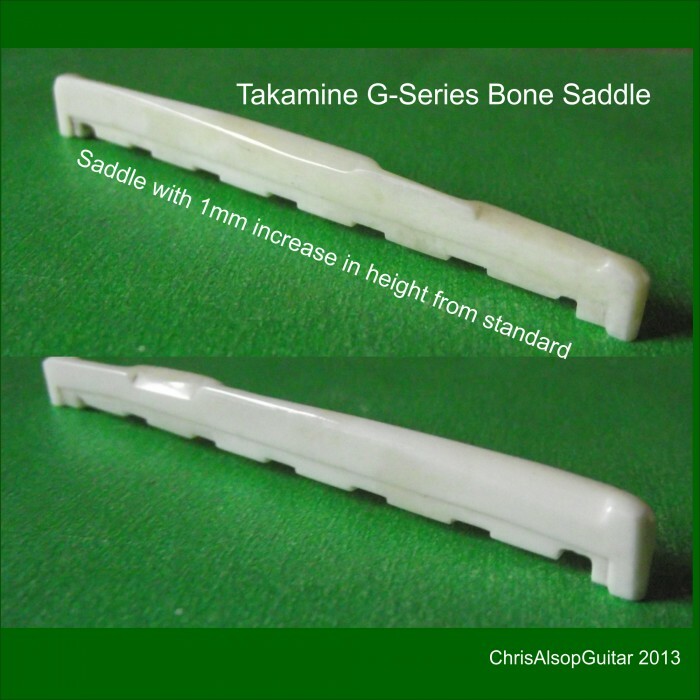 Takamine G-Series 1part Saddle in Ox Bone. Height reduction available. Your Takamine G-Series guitar saddle plays a very important part in transmitting the vibration of the strings into the guitars body and pickup. The saddle sits in an aluminium channel that is then push fitted into the guitars bridge slot. Little pads on the base of the saddle bed down onto a piezoelectric strip that is compressed with the vibration of the saddle and produces corresponding electrical signal. 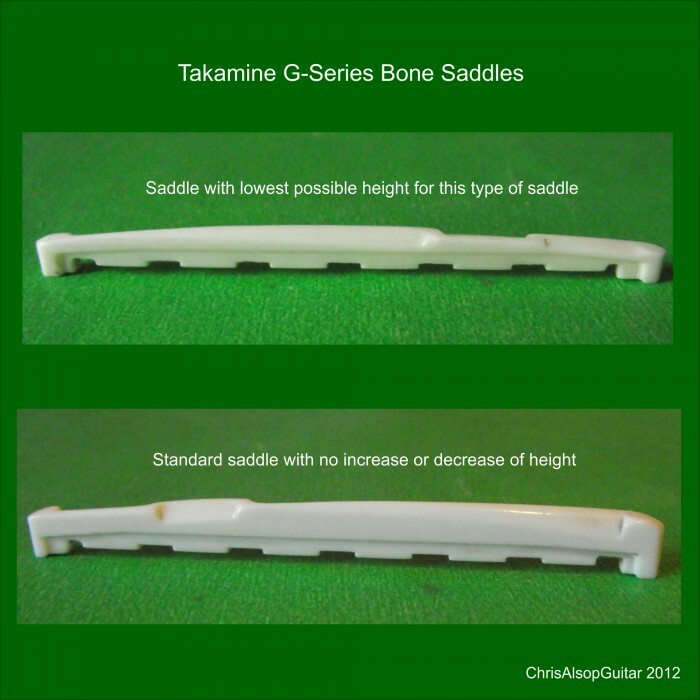 UNLIKE most saddles - its crucial that the base of a Takamine saddle is NOT hand crafted to alter the saddle height - instead the crown of the saddle is shaped - this ensures the pads geometry is not compromised which could result in poor coupling to the pickup. 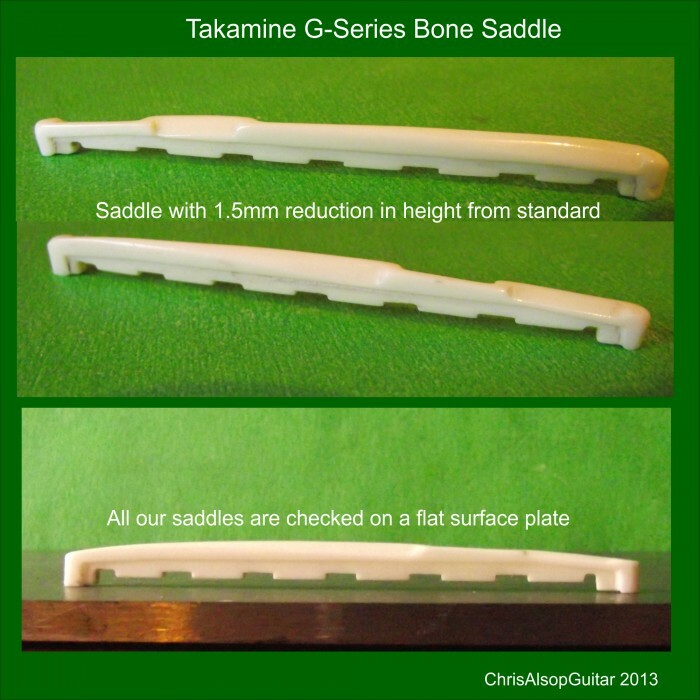 Please note that there is an increased mains noise with this saddle compared to plastic - but the tone is richer. Most find it OK but if not, then we give a full refund of item cost on its return. We do not refund postal cost. On the saddle with 0.0mm Height reduction, the distance from the top of the saddle to the pickup is 6.7mm on the D String. (Please see photos for details of the dimensions.). 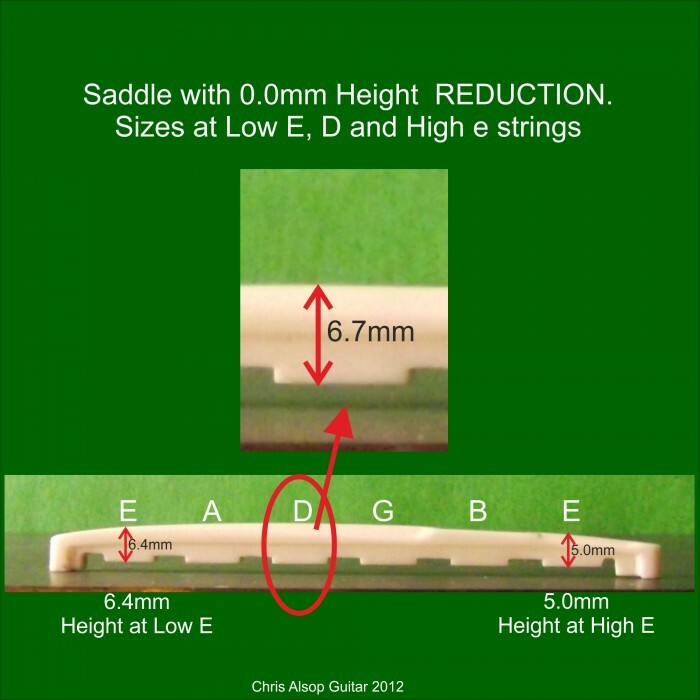 Please see photos for details of these dimensions Please check that your saddle is consistent with these sizes.If your saddle is is HIGHER than 6.7mm at the D String then please contact us so we can adjust the saddle height appropriately. This saddle is made from high density Ox bone and is for use on 6 string steel strung acoustic guitars. The mechanical properties of bone provide a higher level of transmission of high frequencies from the strings which results in a richer sound. The electrical properties of bone result in slightly higher susceptibility to noise. We make the parts using precision measurement, numerically controlled routers, grinders and saws coupled with careful hand finishing and polishing. An accurate, high quality manufacture results. An investigation into its noise susceptibility has been carried out: - the conclusion is that there is an increased noise susceptibility in these saddles compared to plastic saddles. The noise is mains hum and actually comes from the strings picking up stray mains electromagnetic fields. The noise is not due to incorrect mechanical fitting of the saddle on the pickup. There is a solution to the noise that my investigation uncovered and that is to ground the guitar strings - which involved connecting a wire to the outer of the jack plug to the strings at the bridge end or the tuner end . It does work but obviously some effort is needed to make it look good. Pickup Electrical Details - Need for Copper strip electrical isolation. 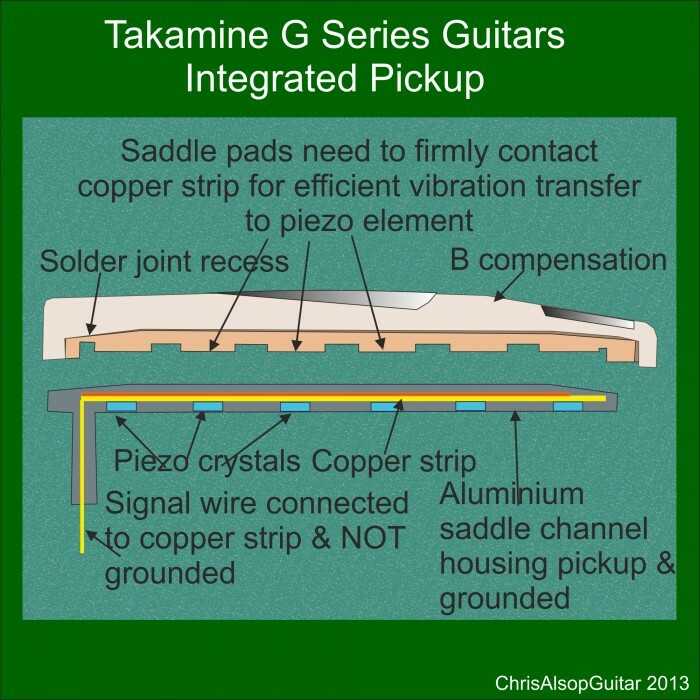 A Takamine pickup has 6 piezo crystals, that generate electrical signal on compression. The crystals are sandwiched between an aluminium channel and a copper strip. Electrical current from the crystals is conducted into the signal cable core that is connected to the copper strip. PLease see the diagram. When you remove the saddle from a Takamine pickup you will see the copper strip inside lying along the base. When the saddle is fitted the little castellations bed down onto this strip. The strip transmits the electrical signal from the piezo crystals to the signal wire. This strip is electrically isolated from the grounded casing and is connected to the core of the signal wire. There is a layer of plastic insulation on the inside of the metal U shaped channel which helps to maintain the electrical isolation of the copper strip.When fitting saddles be gentle as its important to not damage the insulating layer on the metal channel. Please note that the copper strip is isolated from ground - if this is not the case then the pickup is damaged. 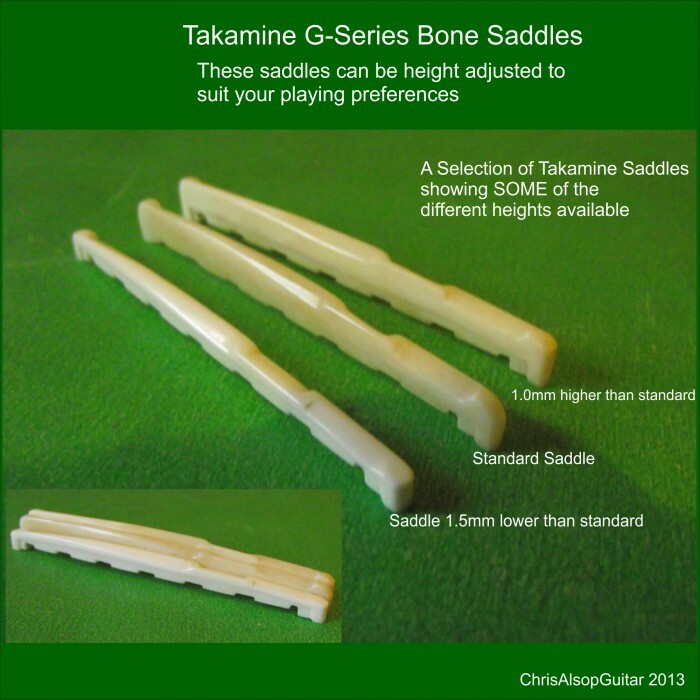 This saddle type is to be used in 6 string Takamine G-Series and some Ovation Applause guitars.